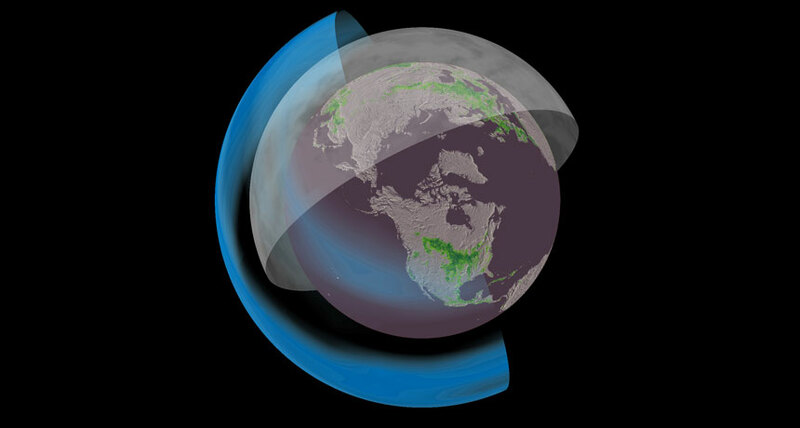 SHADED PLANET Solar geoengineering proposals could combat global warming by injecting reflective particles (blue) into the atmosphere above clouds (gray). By reflecting and scattering light, the particles could cool Earth's temperature and alter rainfall patterns. But that also could reduce the growth of crops (green). Shading Earth by adding a veil of particles to the upper atmosphere may help to offset global warming - but at a cost. Crop yields could decline, as they did following two colossal volcanic eruptions that shot sunlight-blocking sulfur particles high above the cloud layer and into the planet's stratosphere, researchers report online August 8 in Nature. The study is the first to use real-world data to evaluate the potential consequences of such "stratospheric veil" geoengineering. Adding tiny particles called aerosols to the stratosphere, an approach known as solar radiation management, has been proposed as a way of reducing incoming sunlight to cool the planet and mitigate climate change. Some researchers have suggested that this cooling, as well as the scattering of light by the aerosols, could be beneficial to plants and improve crop yields. But by looking at harvests of maize, soy, rice and wheat following volcanic eruptions in 1982 and 1991, scientists determined that these sulfates decreased total incoming solar radiation enough to hurt crop yields in the aftermaths of those eruptions. The team also made projections for how solar radiation management might affect crops in 2050-2069. Those results suggest that any benefits to crops from cooling would be completely offset by decreased food production as a result of reduced sunlight. The powerful volcanic eruptions of Mexico's El Chichon in 1982 and the Philippines' Mount Pinatubo in 1991 shot particles into the stratosphere, briefly increasing the atmospheric layer's aerosol optical depth, a measure of how much light is scattered (top). In the wake of the eruptions, crops suffered (bottom, shown here as percent changes in yield on a logarithmic scale). Globally, the average yield of maize (orange) dropped by more than 5 percent after each eruption, while the average yields of wheat (gray), soy (blue) and rice (green) also temporarily decreased. Powerful volcanic eruptions offer the only possible real-world data on the effects of large concentrations of stratospheric aerosols. In recent decades, there have been just two eruptions strong enough to shoot particles up into Earth's stratosphere - the 1982 eruption of Mexico's El Chichon and the 1991 eruption of the Philippines' Mount Pinatubo. "We can use them as a natural experiment," says study coauthor Jon Proctor, an agricultural economist at the University of California, Berkeley. Sulfur dioxide ejected from the volcanoes was transformed into sulfate aerosols in the stratosphere and remained there for two years. Proctor and colleagues synthesized data collected from 1979 to 2009 on temperature, rainfall, cloud cover, stratospheric aerosols and satellite-based measurements of incoming solar radiation to assess the overall effect on food production. During the two years following the 1991 Pinatubo eruption, which injected some 20 megatons of sulfur dioxide into the atmosphere, the planet dimmed, with about 2.5 percent less sunlight reaching Earth's surface. The combination of beneficial cooling and detrimental darkening overall hurt crops. Average global yields of maize crops dropped by 9.3 percent, while those of soy, rice and wheat crops each dropped by about 4.8 percent, the researchers found. Following the El Chichon eruption, the effect was about half as harmful. "The damages from reduced total light washed out benefits of redistribution of that light," Proctor says. "The scattering was not worth it."